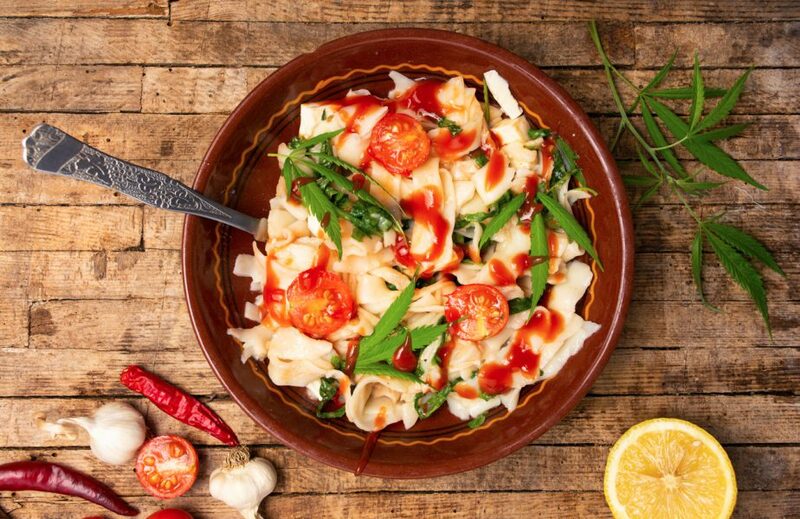 Cooking with cannabis isn’t only a great way to get baked (see what we did there), it’s also one of the healthiest ways to consume marijuana. Apart from a few modest challenges, using it in the kitchen is satisfying, and, eventually, delicious. Biting into an all-natural cannabis-infused treat that you carefully crafted yourself…it doesn’t get much better than that…until that bite sends cannabinoids through your bloodstream, which then bind to receptors in your body (all part of the endocannabinoid system) and start you down a path to physical and mental relief. But with an endless amount of cannabis-infused food possibilities, what’ll you make? Salad? Pasta? Brownies? We recommend starting with the latter; after all, pot brownies are a time-tested staple you should try baking at least once. But that’s just the beginning. Marijuana-infused teas, weed-seasoned popcorn, and vinaigrettes made from cannabis oil are just a few of the culinary delights you can concoct in the kitchen. With that in mind, let’s look at everything you need to know about cooking with cannabis. For patients seeking pain relief over extended periods, cooked marijuana products may be an ideal remedy. Medical marijuana is packed with beneficial compounds called cannabinoids, terpenes, and flavonoids. The body, however, can’t properly absorb these substances in their raw form, so instead, active ingredients, most notably THCA, must be converted into a form the body can use. This process is called decarboxylation, heating the plant material to helps transform compounds like THCA into molecules that can cross the blood-brain barrier and bind to receptors in the endocannabinoid system. As a result, cooked cannabis delivers a fuller range of medical benefits to more of the body. Plus, when it’s digested rather than smoked the body absorbs it more slowly, producing longer lasting effects. When cooking with cannabis the trick is to heat the plant material at a low temperature over an extended time. Experts refer to this as “low and slow.” This method is necessary since some heat is required to activate the decarboxylation process; too much will effectively destroy the cannabinoids, terpenes, and other beneficial compounds. 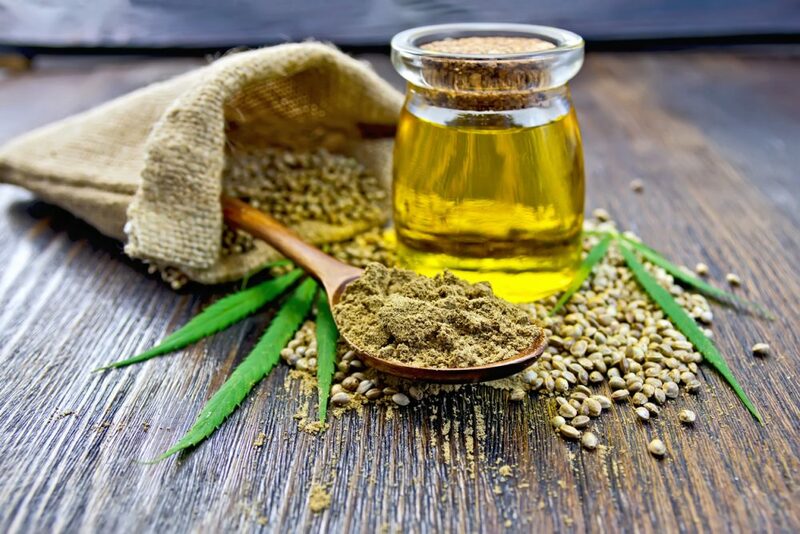 THC and other cannabinoids also need to be infused in a fat-soluble solution, typically butter or oil, or they won’t bind to your body’s endocannabinoid receptors; so recipes for cannabutter or canna oil are central to cooking with cannabis. While taking a hit from a bong, pipe, joint or vaporizer is undoubtedly the fastest way to medicate, it has its drawbacks: lung and throat irritation (though research has found no link between smoking marijuana and lung cancer), dry “cotton” mouth and flavorful smoke, which can cause unwanted attention from law enforcement. Patients, researchers, and physicians are beginning to appreciate the health advantages of mmj edibles, which offer a versatile and delicious way of getting mmj’s benefits without the potential risks associated with smoking. They produce a holistic or “whole body” high. Cooking converts raw THCA into Delta-11 THC, which provides a mellower buzz or “head high” than the Delta-9 THC high that you get from smoking. You can add infused butter and oils to a huge range of foods, dishes and beverages. Their effects last considerably longer than smoking. With precise dosing, you can achieve effects at either end of the medicated spectrum; mild, perfect for maintaining your daily activities, or ridiculously “Superman high” for intense pain relief, restful sleep, or binge-watching House of Cards. Cannabinoids pass through the digestive system where they’re processed by the liver into even more potent forms, so they could be especially well-suited for patients with stomach problems like Crohn’s Disease, irritable bowel syndrome or colitis. The merits for cooking with cannabis are so numerous that you’re really doing yourself a disservice by not, at least, experimenting with them. It’s so much easier to produce high-quality delectable edibles than you think. 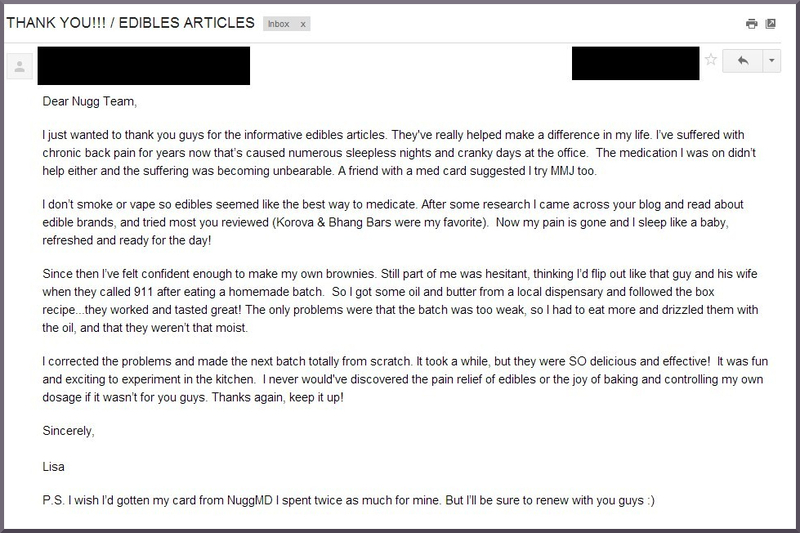 We had a patient email us just a couple days ago, exclaiming that taking the dive into making her own edibles was the most fun she’s had all year, and that her first batch (she made brownies) turned out delicious! Eating or cooking with raw marijuana won’t produce the desired medical or psychoactive effects (although it’s been shown that “juicing” cannabis can provide significant dietary benefits). Cannabinoids must first be infused into a fat-soluble medium—butter, oil or milk—in order to be effective. Proper dosing considerations apply. You want to add an appropriate amount of mmj to achieve your desired results. The cannabinoids, terpenes, and other beneficial compounds in cannabis are both activated and preserved by cooking them at low temperatures for an extended time, so the process can take several hours to complete. 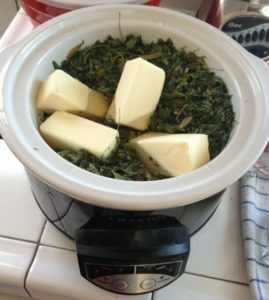 Cannabutter is the best place to start if you want to cook with cannabis. Again, dissolving cannabinoids in a fat-soluble liquid is essential because the body can’t absorb the THCA molecules, nor do they mix well with water. Infusing cannabinoids into butter creates a potent ingredient that can be the foundation for a virtually unlimited number of homemade medical marijuana edibles. Choose a saucepan or double boiler. In most cases, a double boiler will yield better results and require less supervision (either will work well with a little patience and experience). Add the water and butter to the saucepan/boiler; set the stove to low-medium heat. Once the butter has melted, add the ground cannabis to saucepan/boiler. Allow the mixture to simmer over low heat for 2 to 3 hours, stirring occasionally. Don’t let it boil (reduce heat if necessary). After turning off the heat let it cool for 20 minutes. Strain the mixture into large bowl using a cheesecloth, mesh strainer or coffee filter, separating all the plant material. Now all the THC and active ingredients will be in the cannabutter mixture, so you can discard the plant matter or use it as compost. Put the bowl in the refrigerator for at least 12 hours. This will allow the remaining water to separate from the cannabutter, which will rise to the top. Remove the bowl from the refrigerator and separate the butter by pouring out any remaining water. Store your cannabutter in an airtight container in the refrigerator. It should last two months. Remember, with many recipes you’ll still have to follow low-heating methods in order to best preserve the THC and other cannabinoids. Generally speaking, you’d bake brownies at 350°F, but 340°F for a little longer would be best for pot brownies. Likewise, if you normally bake muffins at 400°F, then 375°F would likely be best for pot muffins. Add the oil to a saucepan or double boiler then set the stove to low-medium heat. Add the finely ground cannabis to saucepan/boiler. After turning off the heat let saucepan/boiler cool for 20 minutes. Strain mixture into a large bowl using a cheesecloth, mesh strainer or coffee filter, separating all the plant material. Now all the THC and active ingredients will be in the oil, so you can discard the plant matter or use it as compost. Pour your weed-infused oil into an airtight bottle and store it in the refrigerator. Your edible dosage is an important consideration that can vary due to a variety of factors like your pot’s potency, the temperature used to prepare your goodies, and the food the cannabis is infused with. The amount of THC your body absorbs—and consequently the intensity of your high—will depend on your weight, metabolism, and overall health. It’s highly recommended (by experts, and basically anyone who’s ever eaten too much) to consume only small amounts at first so that you can gauge the effects on your mind and body. It’s also critical that you allow enough time for your stomach to fully process what you’ve ingested; it’s not uncommon for cannabis-laced foods to take more than an hour (sometimes even longer) to truly take effect. BE PATIENT. Always remember — you can always eat more, but you can’t eat less. It’s impossible to fatally overdose from cannabis in any form, but eating too much all at once, particularly for inexperienced users, can produce a very intense and unpleasant experience. If you do find yourself freaking out (how most people would describe their reaction), the effects can be counteracted by consuming citrus fruits, juice products, pistachio nuts, pine nuts, and products rich in CBD (which naturally mitigate THC’s effects). Many patients also report that deep breathing and meditation can bring you back down. None of these quick remedies will completely eliminate your high, but at the very least they’ll act as a nice placebo for calming your nerves. If it’s not already clear, it’s worth repeating—cannabis dosing can be as much of an art as it is a science (at least until the science is allowed to catch up). Start slow, observe how you react, and incrementally increase your dosage until you get the desired effects. 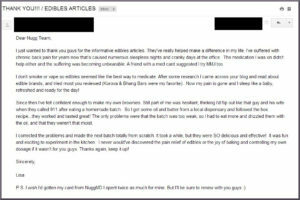 Your edibles experience should be fun, dammit! The time to let out your inner Charlie Sheen was when you found out Trump won the presidency. Anyone unfamiliar with edibles should start with a low-dosage recipe (5 mg to 10 mg) or adjust their portion sizes accordingly. For more advice on consuming edibles responsibly, go online and do some research to help you determine your limits. There are also a variety of cannabis calculators available online that can assist with dosage calculation. Marijuana’s medical benefits have been well-known for thousands of years, but its culinary possibilities are only now being discovered. Renowned cannabis chefs are sprouting up across the country as more states approve medical and recreational marijuana. Their interests often include ethnobiology and microbiology, as well as, of course, cooking. But perhaps their biggest interest is simply helping people. No doubt, there’s quite a buzz about marijuana edibles these days. Indeed, both world-class cannabis chefs and budding homegrown cooks are taking weed’s culinary possibilities to an even higher level. Cannabis has incredible healing properties that can improve your life starting today, you just have to get down and dirty and arm yourself with the knowledge, tools, and resources to make educated and responsible decisions about what this plant can do for you. Need help finding the edible that’s right for you? Chat online with Nugg’s Cannabis Concierge to find the best products to meet your needs – they may even be available for delivery from your local dispensary.